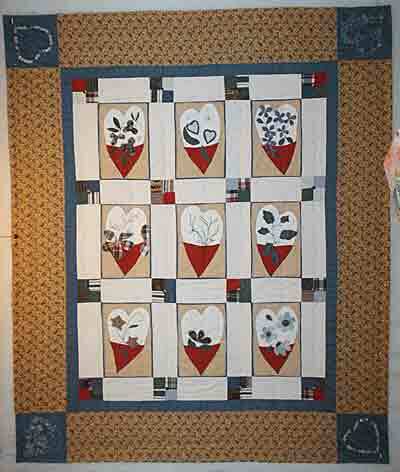 This quilt is an adaptation of your design Rusty Garden Heart. I used your pattern and constructed the quilt for my granddaughter from shirts that were her daddys. She lost her daddy last may and her mom and I wanted her to have something that was his. She is 13 and wanted something pretty. When I saw your pattern in the quilt shop in Granbury, Texas I knew instantly that was 'my' pattern. I had to change things a bit to make it work with the fabrics and colors I had. My son was color blind and the only colors he could see decently were greens, blues, and black. It presented quite a challenge. The buttons used are from his shirts and the hearts, appliques, and 4 x 4 squares are his shirts. I used his buttons on the 2 corners and then did some embroidery work in the other corners from designs I found somewhere. I did the blanket stitching on my machine and the rest of the embroidery was done by hand using button hole thread. Since this is something for a teenager I wanted sturdy construction while maintaining the 'pretty' quilt she wanted. The picture is of the quilt in a frame (I had just finished basting it) and is on it's side in the kitchen propped against a wall...I rotated the pic, hence the kleenex box on the table looks suspended in space...left it so you might consider me to be magic. LOL Thank you for your design, it was the perfect one for my needs. You are welcome to post the pic if you so desire.